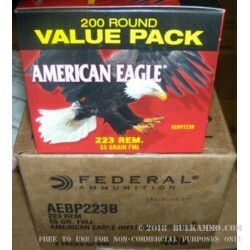 Federal Ammunition has been trusted by American shooter since the 1920s. When it comes to military, law enforcement and hunting and shooting Ammunition, Federal Ammunition delivers a quality product. This 55 grain 5.56x45mm cartridge is produced to US Military and NATO M193 specification and annealed per the military requirement. This cartridge is ideal for use in your AR-15, Mini-14 or other 5.56 rifle for training, target and defensive purposes. M193 ammunition offers superior penetration, accuracy and stopping power for your defensive rifle. 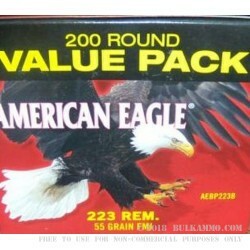 This ammunition has a velocity of 3165 feet per second and energy of 1289 foot pounds. New Production FMJ M193 bullet seated in a brass case. Boxer primed and reloadable.